For other uses, see Fire (disambiguation). The fire maps show the locations of actively burning fires around the world on a monthly basis, based on observations from the Moderate Resolution Imaging Spectroradiometer (MODIS) on NASA's Terra satellite. The colors are based on a count of the number (not size) of fires observed within a 1,000-square-kilometer area. White pixels show the high end of the count—as many as 100 fires in a 1,000-square-kilometer area per day. Yellow pixels show as many as 10 fires, orange shows as many as 5 fires, and red areas as few as 1 fire per day. Fire is hot because the conversion of the weak double bond in molecular oxygen, O2, to the stronger bonds in the combustion products carbon dioxide and water releases energy (418 kJ per 32 g of O2); the bond energies of the fuel play only a minor role here. At a certain point in the combustion reaction, called the ignition point, flames are produced. The flame is the visible portion of the fire. Flames consist primarily of carbon dioxide, water vapor, oxygen and nitrogen. If hot enough, the gases may become ionized to produce plasma. Depending on the substances alight, and any impurities outside, the color of the flame and the fire's intensity will be different. The negative effects of fire include hazard to life and property, atmospheric pollution, and water contamination. If fire removes protective vegetation, heavy rainfall may lead to an increase in soil erosion by water. Also, when vegetation is burned, the nitrogen it contains is released into the atmosphere, unlike elements such as potassium and phosphorus which remain in the ash and are quickly recycled into the soil. This loss of nitrogen caused by a fire produces a long-term reduction in the fertility of the soil, which only slowly recovers as nitrogen is "fixed" from the atmosphere by lightning and by leguminous plants such as clover. Fire has been used by humans in rituals, in agriculture for clearing land, for cooking, generating heat and light, for signaling, propulsion purposes, smelting, forging, incineration of waste, cremation, and as a weapon or mode of destruction. Fires start when a flammable or a combustible material, in combination with a sufficient quantity of an oxidizer such as oxygen gas or another oxygen-rich compound (though non-oxygen oxidizers exist), is exposed to a source of heat or ambient temperature above the flash point for the fuel/oxidizer mix, and is able to sustain a rate of rapid oxidation that produces a chain reaction. This is commonly called the fire tetrahedron. Fire cannot exist without all of these elements in place and in the right proportions. For example, a flammable liquid will start burning only if the fuel and oxygen are in the right proportions. Some fuel-oxygen mixes may require a catalyst, a substance that is not consumed, when added, in any chemical reaction during combustion, but which enables the reactants to combust more readily. If the oxidizer is oxygen from the surrounding air, the presence of a force of gravity, or of some similar force caused by acceleration, is necessary to produce convection, which removes combustion products and brings a supply of oxygen to the fire. Without gravity, a fire rapidly surrounds itself with its own combustion products and non-oxidizing gases from the air, which exclude oxygen and extinguish the fire. Because of this, the risk of fire in a spacecraft is small when it is coasting in inertial flight. This does not apply if oxygen is supplied to the fire by some process other than thermal convection. 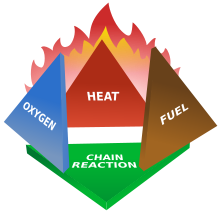 application of a retardant chemical such as Halon to the flame, which retards the chemical reaction itself until the rate of combustion is too slow to maintain the chain reaction. 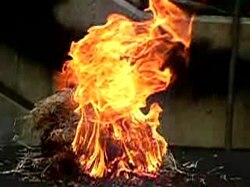 In contrast, fire is intensified by increasing the overall rate of combustion. Methods to do this include balancing the input of fuel and oxidizer to stoichiometric proportions, increasing fuel and oxidizer input in this balanced mix, increasing the ambient temperature so the fire's own heat is better able to sustain combustion, or providing a catalyst, a non-reactant medium in which the fuel and oxidizer can more readily react. A flame is a mixture of reacting gases and solids emitting visible, infrared, and sometimes ultraviolet light, the frequency spectrum of which depends on the chemical composition of the burning material and intermediate reaction products. In many cases, such as the burning of organic matter, for example wood, or the incomplete combustion of gas, incandescent solid particles called soot produce the familiar red-orange glow of "fire". This light has a continuous spectrum. Complete combustion of gas has a dim blue color due to the emission of single-wavelength radiation from various electron transitions in the excited molecules formed in the flame. Usually oxygen is involved, but hydrogen burning in chlorine also produces a flame, producing hydrogen chloride (HCl). Other possible combinations producing flames, amongst many, are fluorine and hydrogen, and hydrazine and nitrogen tetroxide. Hydrogen and hydrazine/UDMH flames are similarly pale blue, while burning boron and its compounds, evaluated in mid-20th century as a high energy fuel for jet and rocket engines, emits intense green flame, leading to its informal nickname of "Green Dragon". The glow of a flame is complex. Black-body radiation is emitted from soot, gas, and fuel particles, though the soot particles are too small to behave like perfect blackbodies. There is also photon emission by de-excited atoms and molecules in the gases. Much of the radiation is emitted in the visible and infrared bands. The color depends on temperature for the black-body radiation, and on chemical makeup for the emission spectra. The dominant color in a flame changes with temperature. The photo of the forest fire in Canada is an excellent example of this variation. Near the ground, where most burning is occurring, the fire is white, the hottest color possible for organic material in general, or yellow. Above the yellow region, the color changes to orange, which is cooler, then red, which is cooler still. Above the red region, combustion no longer occurs, and the uncombusted carbon particles are visible as black smoke. The common distribution of a flame under normal gravity conditions depends on convection, as soot tends to rise to the top of a general flame, as in a candle in normal gravity conditions, making it yellow. In micro gravity or zero gravity, such as an environment in outer space, convection no longer occurs, and the flame becomes spherical, with a tendency to become more blue and more efficient (although it may go out if not moved steadily, as the CO2 from combustion does not disperse as readily in micro gravity, and tends to smother the flame). There are several possible explanations for this difference, of which the most likely is that the temperature is sufficiently evenly distributed that soot is not formed and complete combustion occurs. 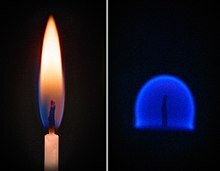 Experiments by NASA reveal that diffusion flames in micro gravity allow more soot to be completely oxidized after they are produced than diffusion flames on Earth, because of a series of mechanisms that behave differently in micro gravity when compared to normal gravity conditions. These discoveries have potential applications in applied science and industry, especially concerning fuel efficiency. In combustion engines, various steps are taken to eliminate a flame. The method depends mainly on whether the fuel is oil, wood, or a high-energy fuel such as jet fuel. It is true that objects at specific temperatures do radiate visible light. Objects whose surface is at a temperature above approximately 400 °C (752 °F) will glow, emitting light at a color that indicates the temperature of that surface. See the section on red heat for more about this effect. It is a misconception that one can judge the temperature of a fire by the color of its flames or the sparks in the flames. For many reasons, chemically and optically, these colors may not match the red/orange/yellow/white heat temperatures on the chart. Barium nitrate burns a bright green, for instance, and this is not present on the heat chart. The "adiabatic flame temperature" of a given fuel and oxidizer pair indicates the temperature at which the gases achieve stable combustion. Always hotter in the middle. Every natural ecosystem has its own fire regime, and the organisms in those ecosystems are adapted to or dependent upon that fire regime. Fire creates a mosaic of different habitat patches, each at a different stage of succession. Different species of plants, animals, and microbes specialize in exploiting a particular stage, and by creating these different types of patches, fire allows a greater number of species to exist within a landscape. The fossil record of fire first appears with the establishment of a land-based flora in the Middle Ordovician period, 470 million years ago, permitting the accumulation of oxygen in the atmosphere as never before, as the new hordes of land plants pumped it out as a waste product. When this concentration rose above 13%, it permitted the possibility of wildfire. Wildfire is first recorded in the Late Silurian fossil record, 420 million years ago, by fossils of charcoalified plants. Apart from a controversial gap in the Late Devonian, charcoal is present ever since. The level of atmospheric oxygen is closely related to the prevalence of charcoal: clearly oxygen is the key factor in the abundance of wildfire. Fire also became more abundant when grasses radiated and became the dominant component of many ecosystems, around 6 to 7 million years ago; this kindling provided tinder which allowed for the more rapid spread of fire. These widespread fires may have initiated a positive feedback process, whereby they produced a warmer, drier climate more conducive to fire. The ability to control fire was a dramatic change in the habits of early humans. Making fire to generate heat and light made it possible for people to cook food, simultaneously increasing the variety and availability of nutrients and reducing disease by killing organisms in the food. The heat produced would also help people stay warm in cold weather, enabling them to live in cooler climates. Fire also kept nocturnal predators at bay. Evidence of cooked food is found from 1.9 million years ago, although there is a theory that fire could have been used in a controlled fashion about 1 million years ago. Evidence becomes widespread around 50 to 100 thousand years ago, suggesting regular use from this time; resistance to air pollution started to evolve in human populations at a similar point in time. The use of fire became progressively more sophisticated, with it being used to create charcoal and to control wildlife from tens of thousands of years ago. Fire has also been used for centuries as a method of torture and execution, as evidenced by death by burning as well as torture devices such as the iron boot, which could be filled with water, oil, or even lead and then heated over an open fire to the agony of the wearer. By the Neolithic Revolution, during the introduction of grain-based agriculture, people all over the world used fire as a tool in landscape management. These fires were typically controlled burns or "cool fires", as opposed to uncontrolled "hot fires", which damage the soil. Hot fires destroy plants and animals, and endanger communities. This is especially a problem in the forests of today where traditional burning is prevented in order to encourage the growth of timber crops. Cool fires are generally conducted in the spring and autumn. They clear undergrowth, burning up biomass that could trigger a hot fire should it get too dense. They provide a greater variety of environments, which encourages game and plant diversity. For humans, they make dense, impassable forests traversable. Another human use for fire in regards to landscape management is its use to clear land for agriculture. Slash-and-burn agriculture is still common across much of tropical Africa, Asia and South America. "For small farmers, it is a convenient way to clear overgrown areas and release nutrients from standing vegetation back into the soil", said Miguel Pinedo-Vasquez, an ecologist at the Earth Institute’s Center for Environmental Research and Conservation. However this useful strategy is also problematic. Growing population, fragmentation of forests and warming climate are making the earth's surface more prone to ever-larger escaped fires. These harm ecosystems and human infrastructure, cause health problems, and send up spirals of carbon and soot that may encourage even more warming of the atmosphere – and thus feed back into more fires. Globally today, as much as 5 million square kilometres – an area more than half the size of the United States – burns in a given year. There are numerous modern applications of fire. In its broadest sense, fire is used by nearly every human being on earth in a controlled setting every day. Users of internal combustion vehicles employ fire every time they drive. Thermal power stations provide electricity for a large percentage of humanity. The use of fire in warfare has a long history. Fire was the basis of all early thermal weapons. Homer detailed the use of fire by Greek soldiers who hid in a wooden horse to burn Troy during the Trojan war. Later the Byzantine fleet used Greek fire to attack ships and men. In the First World War, the first modern flamethrowers were used by infantry, and were successfully mounted on armoured vehicles in the Second World War. 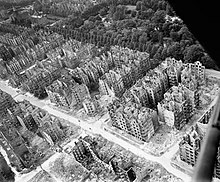 In the latter war, incendiary bombs were used by Axis and Allies alike, notably on Tokyo, Rotterdam, London, Hamburg and, notoriously, at Dresden; in the latter two cases firestorms were deliberately caused in which a ring of fire surrounding each city was drawn inward by an updraft caused by a central cluster of fires. The United States Army Air Force also extensively used incendiaries against Japanese targets in the latter months of the war, devastating entire cities constructed primarily of wood and paper houses. The use of napalm was employed in July 1944, towards the end of the Second World War; although its use did not gain public attention until the Vietnam War. Molotov cocktails were also used. Setting fuel aflame releases usable energy. Wood was a prehistoric fuel, and is still viable today. The use of fossil fuels, such as petroleum, natural gas, and coal, in power plants supplies the vast majority of the world's electricity today; the International Energy Agency states that nearly 80% of the world's power came from these sources in 2002. The fire in a power station is used to heat water, creating steam that drives turbines. The turbines then spin an electric generator to produce electricity. Fire is also used to provide mechanical work directly, in both external and internal combustion engines. The unburnable solid remains of a combustible material left after a fire is called clinker if its melting point is below the flame temperature, so that it fuses and then solidifies as it cools, and ash if its melting point is above the flame temperature. This visualization shows fires detected in the United States from July 2002 through July 2011. Look for fires that reliably burn each year in western states and across the Southeast. Wildfire prevention programs around the world may employ techniques such as wildland fire use and prescribed or controlled burns. Wildland fire use refers to any fire of natural causes that is monitored but allowed to burn. Controlled burns are fires ignited by government agencies under less dangerous weather conditions. Fire fighting services are provided in most developed areas to extinguish or contain uncontrolled fires. Trained firefighters use fire apparatus, water supply resources such as water mains and fire hydrants or they might use A and B class foam depending on what is feeding the fire. Fire prevention is intended to reduce sources of ignition. Fire prevention also includes education to teach people how to avoid causing fires. Buildings, especially schools and tall buildings, often conduct fire drills to inform and prepare citizens on how to react to a building fire. Purposely starting destructive fires constitutes arson and is a crime in most jurisdictions. Model building codes require passive fire protection and active fire protection systems to minimize damage resulting from a fire. The most common form of active fire protection is fire sprinklers. To maximize passive fire protection of buildings, building materials and furnishings in most developed countries are tested for fire-resistance, combustibility and flammability. Upholstery, carpeting and plastics used in vehicles and vessels are also tested. Where fire prevention and fire protection have failed to prevent damage, fire insurance can mitigate the financial impact. Different restoration methods and measures are used depending on the type of fire damage that occurred. Restoration after fire damage can be performed by property management teams, building maintenance personnel, or by the homeowners themselves; however, contacting a certified professional fire damage restoration specialist is often regarded as the safest way to restore fire damaged property due to their training and extensive experience. Most are usually listed under "Fire and Water Restoration" and they can help speed repairs, whether for individual homeowners or for the largest of institutions. Fire and Water Restoration companies are regulated by the appropriate state's Department of Consumer Affairs – usually the state contractors license board. In California, all Fire and Water Restoration companies must register with the California Contractors State License Board. Presently, the California Contractors State License Board has no specific classification for "water and fire damage restoration." Hence, the Contractor's State License Board requires both an asbestos certification (ASB) as well as a demolition classification (C-21) in order to perform Fire and Water Restoration work. ^ "Glossary of Wildland Fire Terminology" (PDF). National Wildfire Coordinating Group. November 2009. Retrieved 2008-12-18. ^ Schmidt-Rohr, K (2015). "Why Combustions Are Always Exothermic, Yielding About 418 kJ per Mole of O2". J. Chem. Educ. 92 (12): 2094–99. Bibcode:2015JChEd..92.2094S. doi:10.1021/acs.jchemed.5b00333. ^ Helmenstine, Anne Marie. "What is the State of Matter of Fire or Flame? Is it a Liquid, Solid, or Gas?". About.com. Retrieved 2009-01-21. ^ Morris, S. E.; Moses, T. A. (1987). "Forest Fire and the Natural Soil Erosion Regime in the Colorado Front Range". Annals of the Association of American Geographers. 77 (2): 245–54. doi:10.1111/j.1467-8306.1987.tb00156.x. ^ NASA Johnson (29 August 2008). "Ask Astronaut Greg Chamitoff: Light a Match!". Retrieved 30 December 2016 – via YouTube. ^ Inglis-Arkell, Esther. "How does fire behave in zero gravity?". Retrieved 30 December 2016. ^ Spiral flames in microgravity Archived 2010-03-19 at the Wayback Machine, National Aeronautics and Space Administration, 2000. ^ CFM-1 experiment results Archived 2007-09-12 at the Wayback Machine, National Aeronautics and Space Administration, April 2005. ^ LSP-1 experiment results Archived 2007-03-12 at the Wayback Machine, National Aeronautics and Space Administration, April 2005. ^ Wellman, C. H.; Gray, J. (2000). "The microfossil record of early land plants". Philos Trans R Soc Lond B Biol Sci. 355 (1398): 717–31, discussion 731–2. doi:10.1098/rstb.2000.0612. PMC 1692785. PMID 10905606. ^ Jones, Timothy P.; Chaloner, William G. (1991). "Fossil charcoal, its recognition and palaeoatmospheric significance". Palaeogeography, Palaeoclimatology, Palaeoecology. 97 (1–2): 39–50. Bibcode:1991PPP....97...39J. doi:10.1016/0031-0182(91)90180-Y. ^ Glasspool, I.J. ; Edwards, D.; Axe, L. (2004). "Charcoal in the Silurian as evidence for the earliest wildfire". Geology. 32 (5): 381–383. Bibcode:2004Geo....32..381G. doi:10.1130/G20363.1. ^ a b Scott, AC; Glasspool, IJ (2006). "The diversification of Paleozoic fire systems and fluctuations in atmospheric oxygen concentration". Proceedings of the National Academy of Sciences of the United States of America. 103 (29): 10861–5. Bibcode:2006PNAS..10310861S. doi:10.1073/pnas.0604090103. PMC 1544139. PMID 16832054. ^ a b c Bowman, D. M. J. S.; Balch, J. K.; Artaxo, P.; Bond, W. J.; Carlson, J. M.; Cochrane, M. A.; d'Antonio, C. M.; Defries, R. S.; Doyle, J. C.; Harrison, S. P.; Johnston, F. H.; Keeley, J. E.; Krawchuk, M. A.; Kull, C. A.; Marston, J. B.; Moritz, M. A.; Prentice, I. C.; Roos, C. I.; Scott, A. C.; Swetnam, T. W.; Van Der Werf, G. R.; Pyne, S. J. (2009). "Fire in the Earth system". Science. 324 (5926): 481–4. Bibcode:2009Sci...324..481B. doi:10.1126/science.1163886. PMID 19390038. ^ Retallack, Gregory J. (1997). 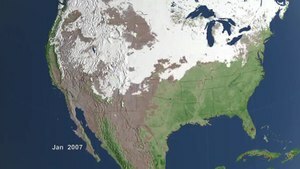 "Neogene expansion of the North American prairie". PALAIOS. 12 (4): 380–90. doi:10.2307/3515337. ^ J. A. J. Gowlett; R. W. Wrangham (2013). "Earliest fire in Africa: towards the convergence of archaeological evidence and the cooking hypothesis". Azania: Archaeological Research in Africa. 48:1: 5–30. doi:10.1080/0067270X.2012.756754. ^ a b c Bowman, D. M. J. S.; Balch, J. K.; Artaxo, P.; Bond, W. J.; Carlson, J. M.; Cochrane, M. A.; d'Antonio, C. M.; Defries, R. S.; Doyle, J. C.; Harrison, S. P.; Johnston, F. H.; Keeley, J. E.; Krawchuk, M. A.; Kull, C. A.; Marston, J. B.; Moritz, M. A.; Prentice, I. C.; Roos, C. I.; Scott, A. C.; Swetnam, T. W.; Van Der Werf, G. R.; Pyne, S. J. (2009). "Fire in the Earth system". Science. 324 (5926): 481–84. Bibcode:2009Sci...324..481B. doi:10.1126/science.1163886. PMID 19390038. ^ Early humans harnessed fire as early as a million years ago, much earlier than previously thought, suggests evidence unearthed in a cave in South Africa." ^ a b "Farmers, Flames and Climate: Are We Entering an Age of 'Mega-Fires'? – State of the Planet". Blogs.ei.columbia.edu. Retrieved 2012-05-23. ^ a b "Napalm". GlobalSecurity.org. Retrieved 8 May 2010. ^ "Share of Total Primary Energy Supply, 2002; International Energy Agency". Archived from the original on 13 January 2015. ^ Federal Fire and Aviation Operations Action Plan, 4. ^ "UK: The Role of Fire in the Ecology of Heathland in Southern Britain". International Forest Fire News. 18: 80–81. January 1998. ^ "Prescribed Fires". SmokeyBear.com. Archived from the original on 2008-10-20. Retrieved 2008-11-21. ^ Ward, Michael. Fire Officer: Principles and Practice. Jones & Bartlett Learning. ISBN 9780763722470. Retrieved March 16, 2019. ^ Baars, Hans; Smulders, Andre; Hintzbergen, Kees; Hintzbergen, Jule (2015-04-15). Foundations of Information Security Based on ISO27001 and ISO27002 – 3rd revised edition. Van Haren. ISBN 9789401805414. ^ "US Department of Homeland Security, US Fire Administration Handbook". Usfa.dhs.gov. 2010-05-06. Archived from the original on 2011-08-27. Retrieved 2012-05-23. ^ Begal, Bill (August 23, 2007). "Restoration With a Capital E-P-A: A Case Study". Restoration & Remediation. Retrieved 2008-04-11. ^ "California Contractors State License Board". State of California. Retrieved 2010-08-29. ^ "What You Should Know About Your Water Damage Or Mold Removal Company:". Rapco West Environmental Services, Inc. Archived from the original on 2011-01-07. Retrieved 2010-08-29. Karki, Sameer (2002). "Community Involvement in and Management of Forest Fires in South East Asia" (PDF). Project FireFight South East Asia. Archived from the original (PDF) on February 25, 2009. Retrieved 2009-02-13. Lentile, Leigh B.; Holden, Zachary A.; Smith, Alistair M. S.; Falkowski, Michael J.; Hudak, Andrew T.; Morgan, Penelope; Lewis, Sarah A.; Gessler, Paul E.; Benson, Nate C (2006). "Remote sensing techniques to assess active fire characteristics and post-fire effects". International Journal of Wildland Fire. 3 (15): 319–345. doi:10.1071/WF05097. Wikimedia Commons has media related to Fire. This page was last edited on 16 March 2019, at 04:45 (UTC).